The Prairie State Film Festival was founded in 2011 by Willy Adkins (Breaking Fate Entertainment) as a multi-genre film festival offering awards in several categories, and includes one award dedicated to films made at least in part in the great state of Illinois! In 2019 Tom McNicholas is taking over as Festival Director via his new entertainment company Northern Illinois Entertainment! 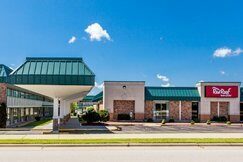 Our 2019 Festival will take place on June 29th at the Red Roof Inn in Dekalb, IL.